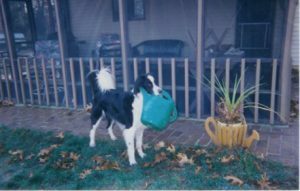 In March of 1997, I developed a keen interest in dog behavior and training after adopting “Jack,” a very mixed-up aggressive Border Collie. I was able to get help from a local obedience trainer who taught me how to use clicker training to rehabilitate my dog. After spending months working on behavior modification with him, I saw how positive training methods were so effective in motivating Jack to change his negative emotions and behaviors. The pictures below were taken during that very difficult and stressful time, As you can see, Jack began to “lighten up” and show that he actually had a great sense of humor. Sadly, my beautiful dog died much too early of a fatal liver disease at the young age of 6 years. Thinking back over the time he shared his life with me, he had chronic digestive problems, which may have been the root cause of his aggressive behavior. I never realized how one dog could completely change someone’s life! My husband and I owned a gift shop in the Berlin Farmer’s Market (in Berlin, NJ) for 27 years. Thanks to Jack, we sold that store so that I could go out and professionally train other dogs. I don’t do any showing or trialing. I also don’t train agility or flyball. I leave that for other trainers. My goal is to prevent dogs from winding up in animal shelters and to help keep them in their forever homes. I do this by educating dog owners about dog behavior, and by training their dogs to be polite, well-mannered companion pets. You can read about Jack here. Listen to Renee’s interview about Jack with Dog Cast Radio. I have volunteered my time as the trainer for the Animal Adoption Center in Lindenwold, NJ and have spoken to the volunteers at the Camden County Animal Shelter and the Cumberland County SPCA animal shelter about how to clicker train their dogs in order to successfully adopt them out to their forever homes. I have been asked on numerous occasions to evaluate and work with dogs fostered and adopted from New Jersey Boxer Rescue. I’ve also been referred to many people by Delaware Valley Golden Retriever Rescue to help acclimate their adopted Goldens in their new homes. I hosted a weekly 30 minute talk radio program on WNJC – 1360 AM called “Thursday in the Doghouse.” The program was on for 30 minutes each Thursday and we discussed all sorts of issues concerning our canine companions. My program was all about educating you, the dog-owning community about every aspect of dogs. If you want to gain a better understanding of canine behavior, please check out my podcasts from these shows. You will hear interviews with well-respected authors, veterinarians, other trainers and dog owners too. We talked a lot about puppies and their needs. We discussed housetraining methods and why so many people want to pull their hair out during the early days of raising puppies. We talked about the challenges of living with adolescent dogs, and we learned about the needs of the elderly dog. Several programs were about the different breeds and how people wind up with the wrong breed of dog for their family’s lifestyle. The subject of dogs is limitless. You can always listen to my programs by clicking on the page, “Renee’s Radio Show” here on my website. Each link indicates what the topic of the program was. 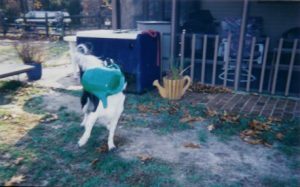 In 2004, I was invited to train puppies in the New Jersey area for the Northstar Foundation. 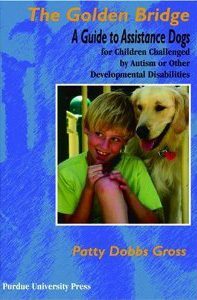 Northstar breeds Golden Retrievers as service dogs primarily for children who are autistic or who have seizures. Teaching puppies is always fun, but learning about Autism and working with the families and the children who suffer from these disorders has been a hugely rewarding and educational experience for me! Thank you, Patty Dobbs Gross for inviting me to participate in your organization. Be sure to check out my “Services and Fees” page here on my website. You’ll see that I work with all breeds of dogs from puppies to the senior citizen (yes, you can teach an old dog new tricks!). I am a Professional Member of the Association of Professional Dog Trainers, Member #160171, as well as a Certified Member of the International Association of Animal Behavior Consultants – Dog Division (Member #30). I am a Professional Member of the Pet Professional Guild of Force-Free Trainers and an AKC Canine Good Citizen Evaluator (#10606).